Aquatic animal health Webinars by the WAVMA. given by leading experts from around the globe. 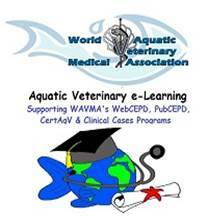 WAVMA’s real-time and recorded WebCEPD webinars are intended as educational programs on key aquatic veterinary issues and techiques to hone the knowledge and skills of practitioners. Currently, the webinars can be viewed at no charge. Previous Post Where to take skin mucus scrape samples from fish? Four sites is my new recommendation. Next Post What causes the abdominal tumours in koi? What is the tumour? Is it caused by a virus?